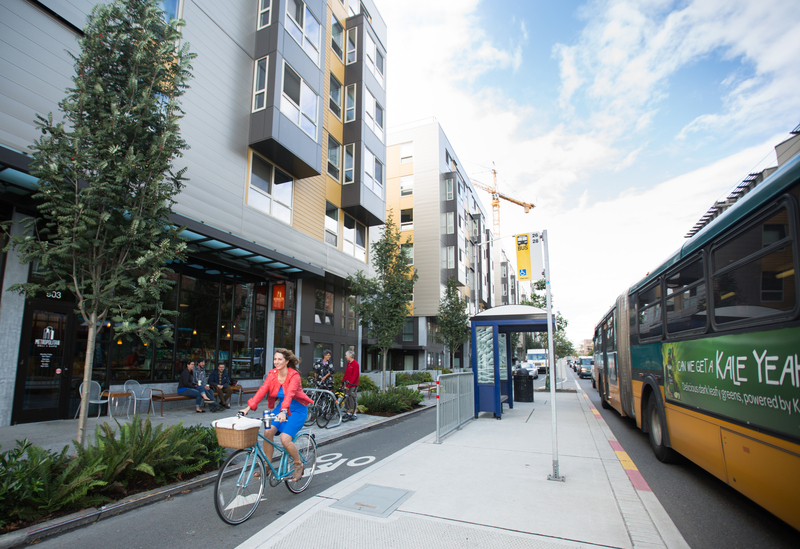 Many neighborhood transit streets and small transit corridors also serve as important bicycle routes. Whether bike lanes are conventional, buffered, or protected, converting to in-lane stops with boarding islands can improve transit speeds and bicycle comfort and safety at the same time, while also making it easier to access transit by bicycle. 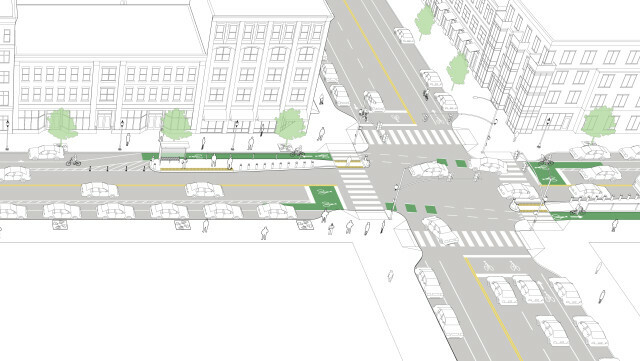 These robust stop designs also raise the profile of transit on the street, consistent with a high-quality service. 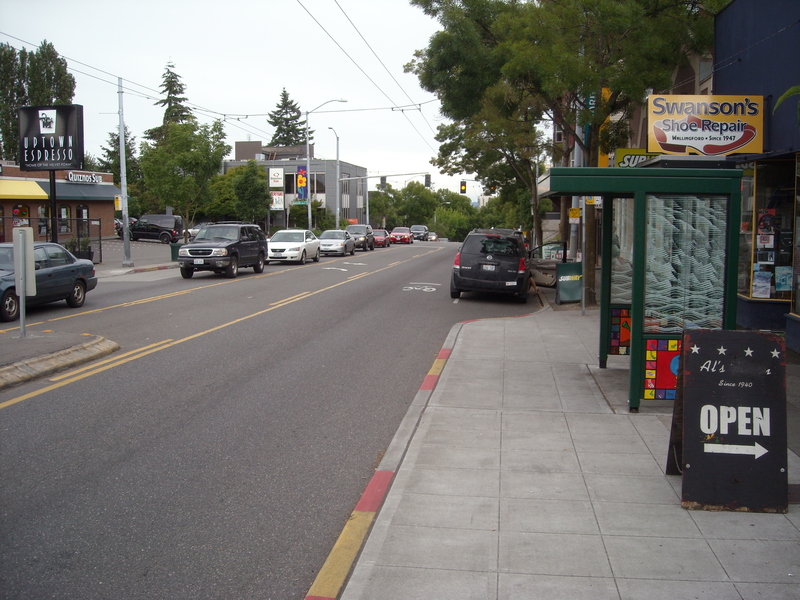 On streets with buffered bike lanes, most stops can be converted to in-lane stops. Buses are no longer required to pull to the curb and re-enter traffic, a major advantage on a street with one lane per direction. Boarding islands direct bicyclists behind transit stops, reducing or eliminating most conflicts between transit vehicles and bicyclists, and expanding available sidewalk space. Eliminating the interaction between buses and bicycles at the curb has potentially large safety benefits for bicyclists, while refuge areas on boarding islands improve pedestrian safety and access by reducing exposure and crossing time. Boarding islands ensure that all-door boarding will be available by keeping other vehicles from blocking the bus stop. With investments in level or near-level stops that permit all-door boarding, increasing the distance between stops (primarily by consolidating stops) can have even stronger travel time benefits. Provide shelters, seating, and off-board fare collection to improve the passenger experience and reduce common sources of delay. High turn volumes are a potential source of delay for through-moving transit. Provide left turn bays for high-volume movements, and place bus stops far-side or at intersections with lower turn volumes where feasible. For streets with tiered local-rapid service, provide occasional pull-out stops, giving rapid and express services and other motor vehicle traffic opportunities to pass the local service. Design boarding islands with pedestrian refuges, shortening crossing distances and enabling shorter signal cycles. Small deflector islands protect pedestrians and tighten turn radii (for additional guidance, see Side-Boarding Islands). Transit and bicycle signal delay can both be reduced with low-speed signal progressions, short cycles, and/or active signal priority to improve transit speeds and reduce corridor-wide travel times. Position bicyclists using intersection crossing markings, and apply green color as the bike lane passes the boarding island. Bicyclists can be positioned in front of motor vehicles at intersections using bike boxes, or left turns can be made using two-stage turn queue boxes. 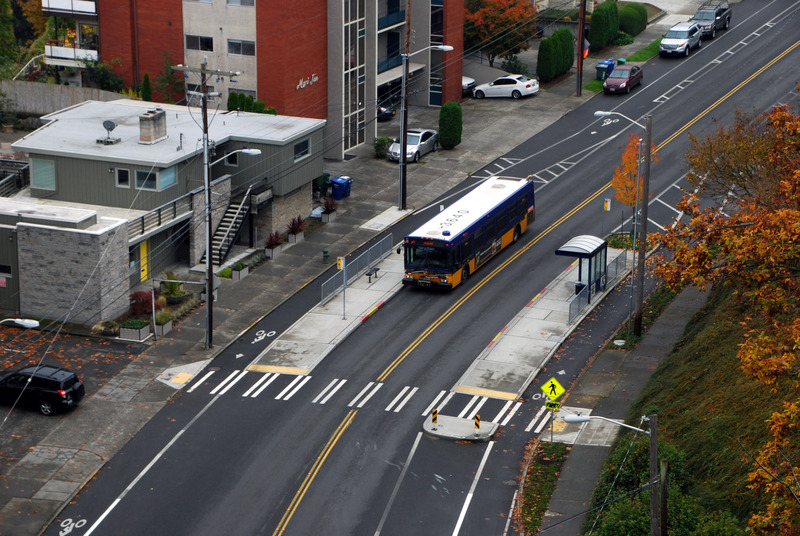 On streetcar routes, use two-stage turn queue boxes to encourage bicyclists to cross tracks at a safe angle. Refer to Bicycle Rail Crossings and the Urban Bikeway Design Guide for additional guidance. Manage parking demand, freight deliveries, and curbside access with dedicated curb space or time-of-day restrictions in retail areas, to reduce blockages of the bike lane or motor vehicle lane. On-street parking can activate underutilized corridor streets and provide a buffer to biking or the pedestrian realm. On-board camera enforcement can be used to deter double-parking, a significant contributor to transit delay on small streets. Harmful ultra-fine particles contained in vehicle exhaust have been shown to dissipate as distance from traffic increases—cycle tracks and sidewalks located opposite parking are exposed to 20-40% less micro-particles than traffic-adjacent facilities. Christine Kendrick, et al. The impact of bicycle lane characteristics on bicyclists’ exposure to traffic-related particulate matter. Transportation Research Board (2010). 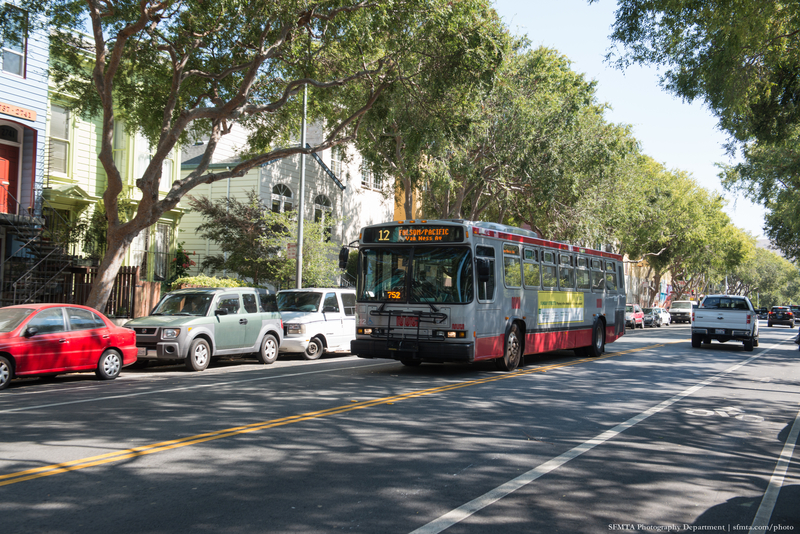 Transit-Only Lane Enforcement using vehicle-mounted video cameras in San Francisco has been cited for reducing transit delays along Geary Boulevard 3–7%, and 15–20% on the 2-Clement and 3-Jackson bus routes. Transit-Only Lane Enforcement. San Francisco Municipal Transportation Agency (2015). 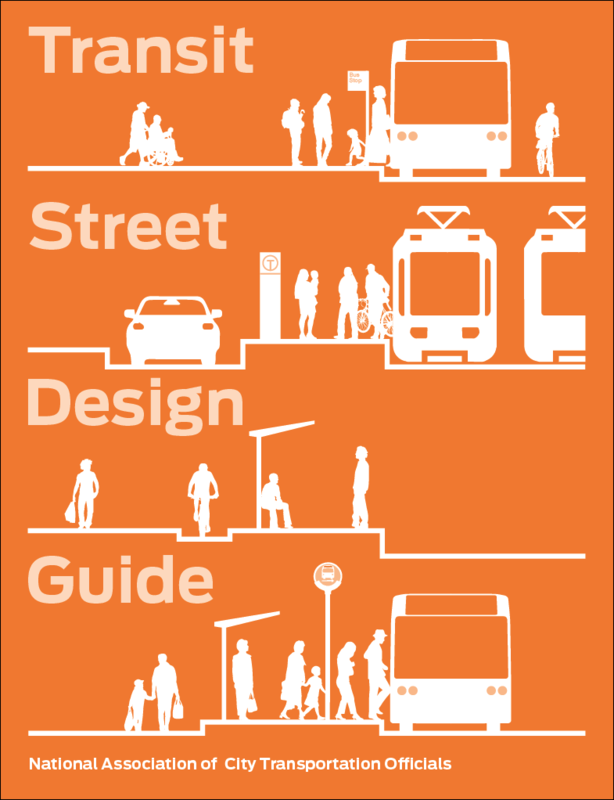 Robust stop designs draw attention to high-quality transit service. References for Neighborhood Transit Street with Bike Lane: 2 found.